Since September, iO has seen 36 teams, featuring over 200 improvisors divided up by their home state, take to the stage to see which state produces the best improv performers. 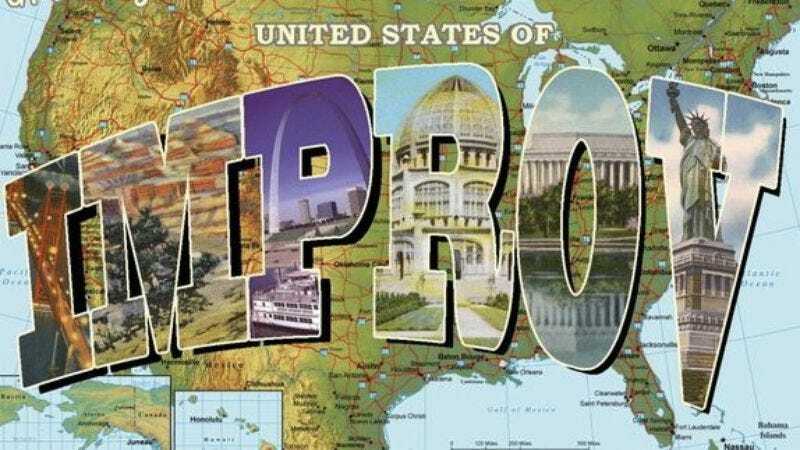 The United States of Improv tournament was formed as a reaction to the seemingly endless bickering between improv students and performers at iO over which state produces the finest comedic talents. In an attempt to solve this problem once and for all, iO looked to the most sacred of decision-making tools for the solution: the bracket system. After a grueling series of showdowns, the final four remaining teams consist of players from Kentucky, Ohio, South Carolina, and Vermont. In advance of the first leg of the final four tournament tomorrow, January 21, at iO's Cabaret Theater, The A.V. Club contacted members of each team to find out why they think their home state will reign supreme and give them a chance to talk a bit of smack on their opponents. Like a good improv scene, Vermont can’t be described. You need to experience its beauty and charm firsthand to “get it.” Vermonters are kind and hard-working and don’t need to split into two large groups to spell their name (Ohio), Vermont couples never decide to “just be cousins”(looking at you, Kentucky), and we never hold any “Welcome home Kwame Brown!” parties (South Carolina’s finest!). What Vermont does have in this competition is a chance. The state is proud to be grouped with such talented competition and pours out Maple Syrup for its fallen team members. Team Vermont looks forward to Saturday night when blue grass withers in the shadow of green mountains. Kentucky may be a small state. It might be smooshed between other bigger, more exciting states like West Virginia and Missouri, but Kentucky knows what it means to win. Muhammad Ali, the Wildcats, Jim Bowie. You might say, “Hey, didn’t Jim Bowie get beat by Mexico at the Alamo?” Technically, this is true, but he invented the Bowie knife, and that’s pretty cool. What does Vermont have? Syrup. South Carolina? Some silly beaches. Ohio… well, they had LeBron, but I think we all saw how that worked out. Team South Carolina is out to preach the truth of the state and dispel all the myths that y’all yankees might be holding onto after the war of Northern aggression. It won’t even matter if we lose, because then we’ll just secede from the Union of the United States… of Improv. We might be too polite to tell the other states how much better at improv we are, but you can trust us, our state motto, “Smiling faces and beautiful places,” applies to our improv audience’s experience as well! We’re pretty sure Vermont is run by commies, Kentucky fell off the map when the Colonel died, and team Ohio better not all be “Drew Carey.” Anybody can be from Ohio, but it takes breeding and Southern manners to be from South Carolina. Ohio had The Drew Carey Show. We are clearly the funniest state. With a name like O-H-iO how could we lose? We had the first traffic light, the first ambulance service, the first hot dog, the first fire department, and we’re going to take the first United States of Improv victory! Buckeyes are way better than Blue Grass, Maple Syrup, and… whatever South Carolina is known for. We’re the best because we have the wisdom of John Glenn, the strength of Jesse Owens, and the creativity of John Goodyear.